I get really excited when a new version of software comes out because I’m anxious to try out all of the new features. While exploring vSphere 5.5 however, I noticed that there are some serious consequences to diving in head first. 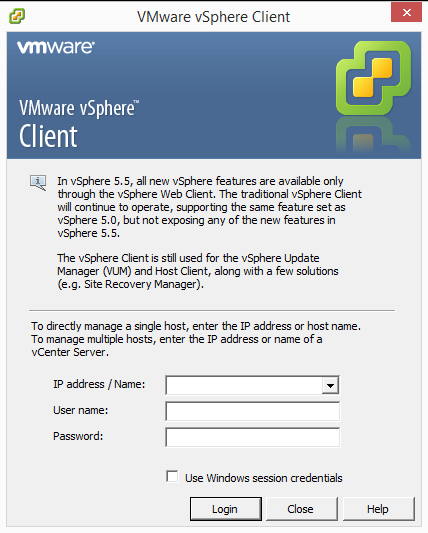 Whether it’s the incompatibility of vSphere 5.5 hardware version 10 with the vSphere thick client or trying to do simple things like install vSphere 5.5 client on a domain controller, VMware has really started sticking it to their fans who use their free products. For example, note in this screen shot that “In vSphere 5.5, all new vSphere features are available only through the vSphere Web Client.” In other words, if you want to use the features we’ve released, pay us a ton of money and go buy vCenter Server. I’m completely befuddled by this response to their fans given Microsoft’s push to drive virtualization costs down by including the fairly full featured hypervisor in it’s server package. I’m certainly not going to avoid using vSphere 5.5, but I if I’m going to use it, I really needed to be able to install vSphere on a Domain Controller. If you download the vSphere 5.5 client and launch it on a domain controller, you get the following message. I started doing some research and it turns out that getting the vSphere 5.5 client installed on a domain controller is as simple as launching the installer from the CLI with a simple flag on the end. Launching it this way causes the client to disregard the fact that it’s installing on a domain controller. Rumor has it that this way of disuading people from installing vSphere client on a domain controller is actually a result of Microsoft’s best practices given the following statement reportedly from VMware directly. In any case, I’ve done it in a production environment without any issues whatsoever and feel comfortable recommending that others do so as well, just like you’ve likely done in the past. Enjoy, and as always, let me know if this helped you. Thanks! Glad to help! Thanks for the help in return. I fixed the quotes in the post based on your comment so thanks! While I do agree that this is a best practice, I think it’s also a bit heavy-handed to not simply make this a warning that you can accept during install – sometimes you just need to get things done with the compute resources you have. Mark, small business owners and IT administrators everywhere couldn’t agree with you more. Even Microsoft was willing to break their own rules to make Microsoft Small Business Server back in the day. They’d have more market share if they’d listen to the little businesses. Great read and explanation though, Joe! Jason, that’s interesting. What OS is the DC? Also, another trick I’ve seen is to try running the installer in compatibility mode. Not sure if that works on a server, but you might try it. Let me know! Thanks for the speedy reply, In this case its a lab Using Server2012R2 Standard x64. I will try to run in compatibility mode and update. UPDATE: Success! I put the installer in Compatibility mode for windows 7 and ran the install form the CLI and success was had. Thanks, Joe! Awesome! Glad to hear it and glad to have been able to help another guy in my line of work. Have a great day! It’s amazing how easy it is when following the right resource. Great Job Joseph , thank your tips. Thanks you! I just used this article for work again myself as did a colleague of mine. Simple but useful. *laugh* Glad I could help before you went bald. Mak, when you add the /VSKIP_OS_CHECKS=”1″, it should be on the end of the executable for the client itself. I’m not sure why your command references autorun.exe… One other option you can try though is launching the installer with compatibility mode for Windows 7. That has also proven to be successful in some instances. Hope that helps. Thanks a million, On my windows 2012 Server this worked great to install esxi 5.5 client. However from this client I also tried to connect to an esxi 5 host and vmware needed another client for that (go figure). Unforturnately the /VSKIP_OS_CHECKS=”1″ trick did not work with the VMware-viclient-all-5.0.0-455964.exe executable. But your note about compatibility mode in Windows 7 did!!!! James, thanks for pointing that out to us. I haven’t tested on those old versions, so that’s great to know and also great to know that compatibility mode still takes care of it. Enjoy! Thanks for your help Joseph..it saved my day! You bet Ajay. Have a great day! Hey thank you sir! First result on Google and the perfect answer to my question! any workaround for the VUM (vsphere Update Manager)? This thing also results in “Windows 2008 or later required” message. Unfortuantely, I don’t have any experience with that particular issue. Sorry! Many thanks – saved my day! Awesome! I know how those drives can be and not making one is definitely the best way. That works on fly. Great and much help. Thanks, exactly what I was looking for. Work fine with the vSphere 5.1 client too. Great post. Works like a charm. I can sort of understand why VMware did this… for a production DC in a secure environment, for example, it is a good setting. Having said that, for most of us, who are in “normal” environments, or have home labs, etc, your solution is a god-send. Thanks so much. Thanks for the bypass os checks flag, greatly appreciated. I am stuck in middle . Im not able to install in vcenter 6 in 2012 R2 server. I m getting error that i cant run vcenter on Domain controller. I saw your comment above to use the command but i m not able to understand where to write that command.Please guide step wise. My first comment would be that unless you have a good reason for it, I’d install the vCSA (vCenter Server Appliance) which is the way of the future and very slick. If you still want to stick with Windows, you will need to run the command from my blog in a command prompt window with administrative privileges. Hope that helps!